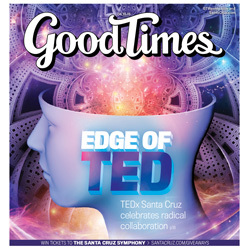 That’s how the Good Times alt-weekly started its cover page story about TEDx:SantaCruz: Radical Collaboration. The story went on to introduce Irene Holombo, one of our co-organizers, who travelled to Bhutan earlier this year and has been asked to return for some high-level collaboration in the South Asian kingdom. Read the entire story at the Good Times website.